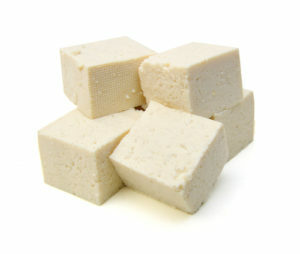 For those of you that prefer to stick to eating vegetables, tofu may be one of your go-to foods. There are different ways to enjoy it, and today we’re going to highlight one that involves some crusted tortilla chips! Let’s get started with the ingredients. Begin by pressing and draining the tofu. Place it on a paper towel and then place additional paper towels on top of it. Place a heavy skillet or book on top and allow the liquid to press out for a minimum of fifteen minutes. A tofu press is another option if you happen to have one. After pressing, cut the tofu in half horizontally and then cut the halves into four shorter sticks. For the marinade, whisk together the sriracha, lime juice, garlic cloves, soy sauce, and olive oil in a medium bowl. Place the tofu in the marinade and move it around so that all sides are covered. Put it in the refrigerator preferably for an hour, but no less than twenty minutes. If the tofu has yet to be covered entirely by the liquid, flip it. Once the tofu looks like it’s nearly done marinating, fire up the oven by preheating it to 400 degrees. Use a baking sheet lined with parchment paper and prepare a trio of bowls. Pour the flour into a shallow medium bowl and stir the onion powder, salt, cumin, and paprika in. Use another bowl for the beaten eggs and place the chips on a plate. Remove all pieces of the tofu from the liquid and allow any excess to drop off. Dip it in the flour, making sure all sides are coated and then get rid of the excess with a gentle shake. Proceed to the next bowl and dip all sides into the egg for a brief moment, again shaking off the excess. Coat all sides with the tortilla chips and then place each tofu stick on the baking sheet. Your baking time for the tofu should be about twenty minutes, making sure to flip it over at the ten minute mark). Once it’s done, remove from the oven and allow it to cool for a bit. This update or recipe is provided by tortilla company Easy Foods Incorporated. Our wholesale tortillas products include corn tortillas, flour tortillas, tortilla chips, and wraps. For more information on our services such as tortilla food service or brands like Tacomex and Vedgee or private label tortillas, please call 305-928-1593. Our business hours are 9 am to 5 pmMonday through Friday Eastern time and we are closed on weekends. 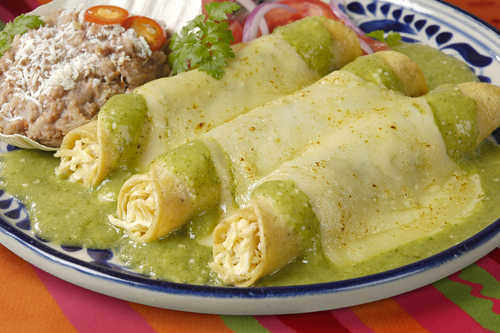 When you need something simple to make on the weekend or a night when you don’t feel like doing too much cooking, you might like this green chicken enchilada recipe. Let’s get started with the ingredients. To prepare the green sauce, simply add the lime zest and juice, tomatillos, jalapeño, garlic, cilantro, and onion into the carafe of a blender and blend until smooth. Place the mixture in a bowl and whisk in the heavy cream, seasoning with salt and pepper. You can now set that aside. For the enchiladas, begin by heating your oven to 350 degrees. Grab a small saucepan and add the chicken stock, black beans, and cumin to a simmer. Use salt and pepper for seasoning and then mash the beans until they’re smooth but chunky. Remove the saucepan from the heat. Set down a tortilla on a cutting board and add a spoonful of the black bean mixture in the center, topping it off with some of the shredded rotisserie chicken. Roll up the tortilla and place it seam side down in a baking dish, preferably one that’s 9×13 inches. Repeat these steps for the rest of the tortillas. Grab the green sauce you set aside and pour it over the tortillas before sprinkling them with some of the Monterey Jack cheese. Throw it in the oven and bake for about twenty minutes until the chicken is warm and the cheese has started to melt and bubble. Take it out the oven and allow the mixture to cool a little before garnishing with the cotija cheese, lime wedges, and cilantro. Begin by preheating your oven to 350 degrees. Grab a 9×13 casserole dish and use cooking spray on it. Use a skillet to heat the olive oil and then add the onion, cooking it until it has softened. Throw in the spices and cook everything for about another minute before adding the sweet potato. Follow by adding the water and cook while covered for an additional twelve minutes. Stir in the black beans and cook until the potatoes become tender, a process that should take about five minutes or so. Grab a damp paper towel and use it to heat the tortillas in a microwave for about a minute or two or until they’re a tad pliable. Fill each one with a spoonful of enchilada sauce and a ¼ cup of filling and the protein you decided on. Place the tortilla in a casserole dish and top with your desired amount of enchilada sauce and some cheese. Place the enchilada in the oven for about 25 minutes. 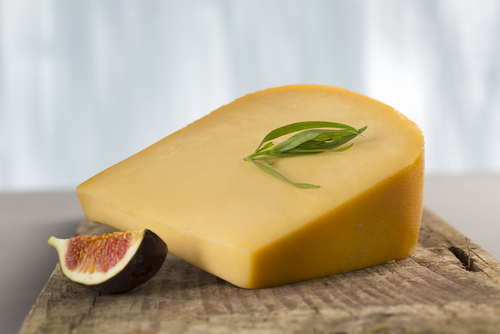 Enjoying some gouda and fig together isn’t necessarily something unusual. Chances are you or someone you know has enjoyed them before. But, have they ever tried these two ingredients mixed within a tortilla? If it sounds like something you might want to try, keep reading below to find out how to prepare it in quesadilla form. Begin by pre-heating a sheet pan in a broiler and moving your oven rack to the highest position. Use the butter to spread and divide it on each tortilla, making sure to only use one side. Follow by sprinkling a bit of cheese near the top, arranging about half of the figs on top of that, and then sprinkling additional cheese. Once you’ve noticed the tortilla is beginning to crisp, move it over to the broiler sheet pan and allow the figs to caramelize. As the first quesadilla is being prepared in the broiler, repeat the aforementioned steps for the second tortilla while it’s in the pan prior to moving it over to the boiler. Once the pan has been emptied, direct your attention back to the first tortilla and top it off with another tortilla, making sure the side you buttered is facing up. Flip it over into the pan so that the second tortilla you just placed on top is now facing down and fry until it’s crispy. 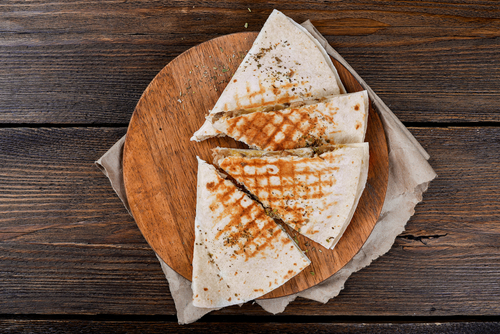 Repeat the process for the other tortillas and you’re ready to enjoy a pair of tasty quesadillas! This update or recipe is provided by tortilla company Easy Foods Incorporated. Our wholesale tortillas products include corn tortillas, flour tortillas, tortilla chips, and wraps. For more information on our services or brands like Tacomex and Vedgee or co-packing tortillas, please call 305-928-1593. Our business hours are 9 am to 5 pmMonday through Friday Eastern time and we are closed on weekends. Begin by preheating your oven to 400 degrees Fahrenheit. Cut the zucchini, pepper, and onion into bite-size pieces and then slice the tomatoes in half before setting them aside. Grab a large saute pan, add the oil, and then cook the zucchini, onion, and pepper on medium heat for five minutes or so or until soft. Follow by adding the beans and a ¼ cup of salsa and then cook for three minutes. You can add more salsa for the taste if you wish. For the quesadillas, use cooking spray on a baking sheet and place three tortillas on it. Grab a spoonful of the vegetable and bean mix to place on the tortillas and then spread to close the edges. Use a 1/3 cup sprinkling of cheese on each tortilla and then place another tortilla on top. Bake for about five to seven minutes or until the cheese has melted and you have a nice, crispy tortilla. Cut the quesadillas into quarters and you’re ready to serve along with whatever salsa you have left. Are you tired of eating traditional breakfast? 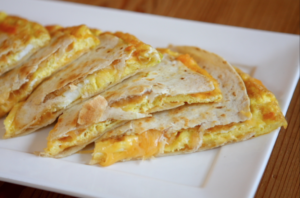 Well try a breakfast quesadilla that is easy, quick to make and is extremely delicious. Coat large nonstick skillet with cooking spray; heat over medium heat until hot. Pour in eggs. As the eggs begin to set, gently pull the eggs across the pan with an inverted turner, forming large soft curds. Continue cooking, pulling, lifting and folding eggs until thickened and no visible liquid egg remains. Do not stir constantly. Spoon the eggs on top of bacon, dividing evenly. Fold the tortillas over filling to cover, making sure to press gently. Clean the skillet. Coat with cooking spray; heat over medium-low heat until hot. Toast quesadillas just until cheese is melted, about 1 to 2 minutes per side. 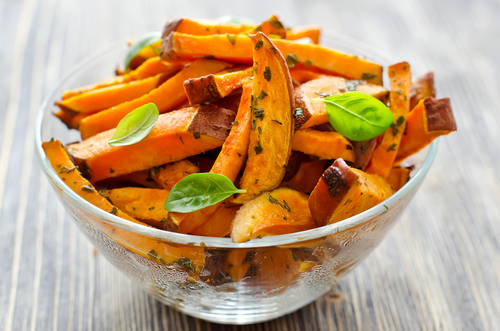 Cut into wedges and serve with salsa.